Wow! This looks amazing. I’ll have to try this! that looks divine! I’ve never had bibimpap and have been looking for a nice recipe for some time. I’ll definitely check out the Korean supermarkets for dolsots as soon as I can. @Cecilia rice sticks? Sounds interesting. I am a fan of all things rice, is it crunchy like rice-cakes? Yum! i love bibimbap! Thanks so much for the suggestions! i think i’ll try this in my new clay pot. 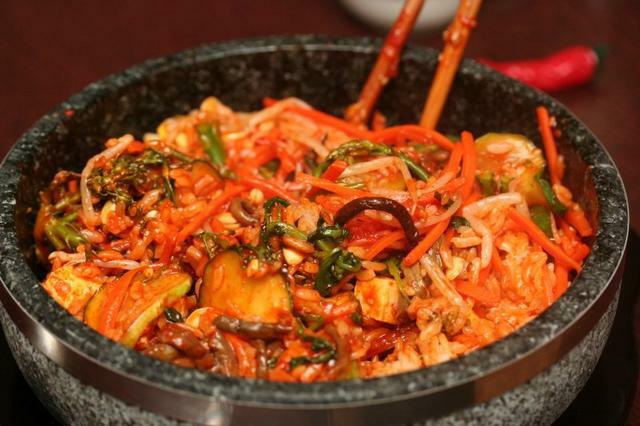 Dolsot bibimbap is definitely a great dish. Nice pictures!!! Here’s a good recipe, easily veganized by leaving out the fish cake! I’ve bought those kinds of rice cakes before (at Mark’s request) from the refrigerated section at Super H, however, I think I’d like to try that recipe using rice cakes from the rice cake machine they allegedly have there that dispenses fresh rice cakes. My friend told me about the rice cake machine, although I’ve been too worried to seek it out because they also have a squid cake machine and I REALLY don’t want to accidentally end up at the squid-o-matic and have tentacles oozing out at me. I love that we share both a affinity for tempeh reubens and Korean food (I lived in Korea for a year myself). I really appreciate both your bibimbap recipe and kimchi recipe. I hope I can try them after I move to Chapel Hill in less than a week. I don’t know if there are Korean grocery stores in Chapel Hill, but I hope so. As for the chewy rice sticks, I believe they are called dakbokki and they are the elongated rice cakes and usually cooked in a spicy sort of sweet sauce, usually with fish cakes, too. I love those chewy rice cakes and couldn’t get enough when I was in Korea. I hope you find more Asian groceries in Chapel Hill than I’ve found in Charleston when visiting Mark’s family (which is none). Also, Mark had me make tempeh reubens for himself and his mom for lunch on Monday! 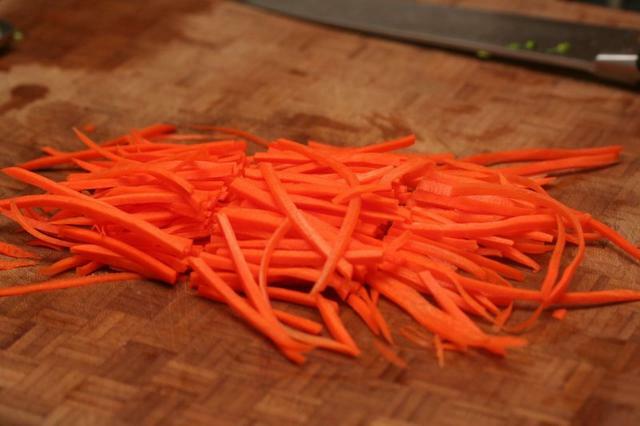 My smooth top cooking surface (oh, the shame! 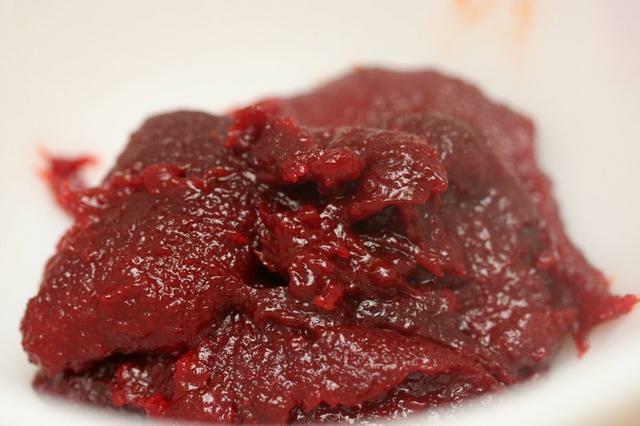 ), has prevented me from cooking with my dolsot. Is it possible to preheat a seasoned granite dolsot in the oven, add the sesame oil and cooked rice, and return it to the oven, prior to adding the rest of the toppings? I’m worried about the rice’s causing the pot to crack from the moisture/temperature change, but I also don’t want my rice to get completely dried out waiting for the pot to get hot enough. Any advice? Camille, I don’t think you’d have any problems doing just that. The stone dolsots are made to withstand high temperatures – I don’t think ANYTHING could crack my dolsots. I’d let the oiled dolsot get as hot as possible in the oven (say 450 Fahrenheit? ), remove and add the rice (which will be hot already anyway if you’ve just made it fresh), then return to the oven for 5 minutes or so before removing again and adding the toppings. 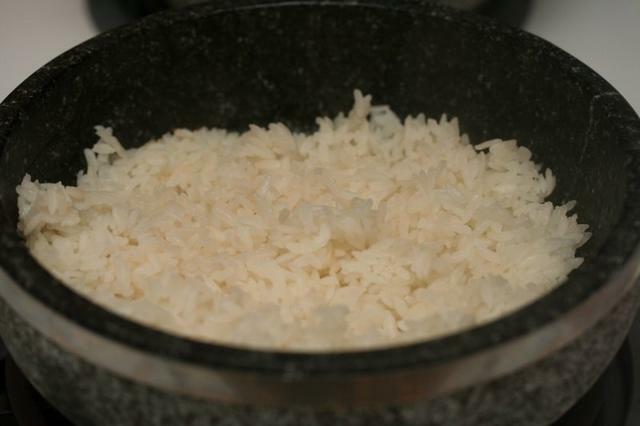 Essentially this is no different than what I do on the stove top, the only difference is the rice may dry out on top in the oven quicker because of the heat so I wouldn’t leave it in for too long after adding the rice. I think the worst problem you’d have would be moving that heavy thing in and out of the oven: make sure you have very good oven mitts! Your pics and recipes are amazing!! “Dol Sot Bi Bim Bap” means “stone pot mix rice” (that’s my best translation). It is absolutely authentic and looks like my moms (although she is not a good cook and hope she is not reading this). TJF is correct about the rice cakes called “Duk Boki”. The dish includes some type of mochi in some savory sauce, stir fried with that “go chu chang” paste and various winter vegetables. I used to love that dish as a child. BTW, your kitty is cute beyond words!! I have a 11 month old Shih Tzu and find myself croppping him out of my pics since he is always by my side, Aren’t pets wonderful!!!! I bought a dolsot but the instructions say: Very important before to use make sure make ready use. I think that means I have to prepare it somehow. Do you know how? 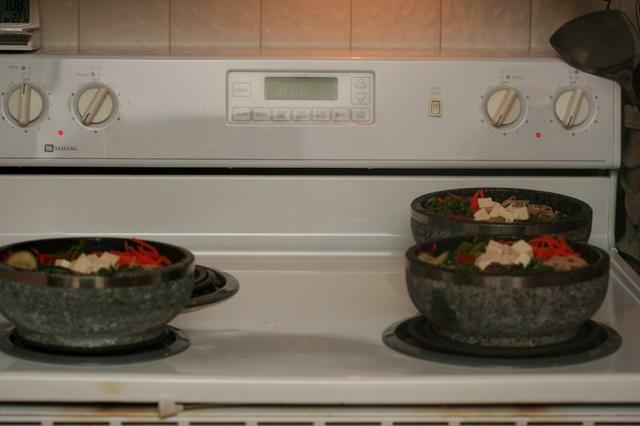 Before the first usage, it is recommended to heat the stone bowl with salty water (1/3 full), until water boils. Then remove the bowl from the direct heat and paint the surface with sesame oil or any other edible oil until oil is no longer permeated. This is to eliminate any cracks and/or breakage due to minor damages to the item. Thank you so much! 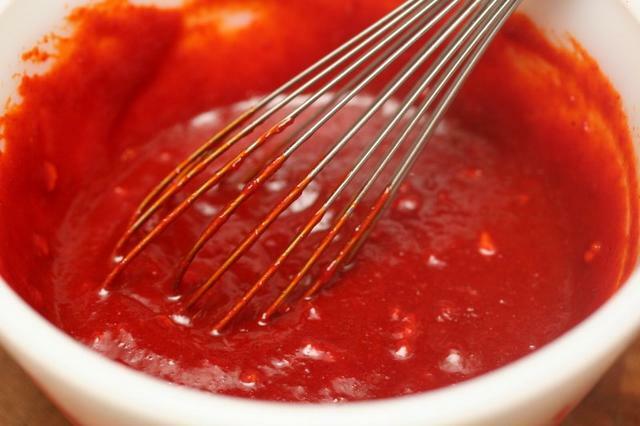 I’ve been trying to locate the sauce for years; I tried asking for it at a local Chinese market recently, but they don’t understand Korean (duh, typical American to assume they could). I tried again this weekend, and she showed me to the bottled Korean BBQ sauce. Well, I may not know what it is, but I know what it isn’t, so next she showed me to the hot sauces and pastes. I never would have been able to pick it out if it wasn’t for your photo!! Eureka! There it was!! I made delicious bibimbap at home, and it tastes 95% like restaurant bibimbap. Once again, thank you! Hi Renee, it’s nice to see someone with my name (albeit spelled more conventionally) here! I’m glad the bibimbap turned out so well. I know I definitely enjoy seeing photos of brands in other blogs so I know what to buy, so I’m glad my pictures helped! Thanks for the great bibimbap tutorial. We’ve eaten it many times in restaurants and tonight I’m taking a shot at preparing it at home. The rice is cooking, the dol sots are ready and waiting, the veggies all prepared. All that remains is the eating! Thank you for this. My husband bought me the stone bowl over a year ago and I never knew how to use it. Now I can copy your recipe. THANKS! What is the ideal size for an adult’s main course supper? There would also be a salad and dessert. Thanx. Hi JHH, I usually just fill the dolsot, although honestly, it’s a pretty big meal and I’d personally not have room for dessert if I finished it! I think typically the answer is to use 1/2 cup rice per serving, and I’d just add as many veggies as fit in your bowl and look nice. Hi, I love your Bibimbap. I like your dolsot which has a stainless steel ring. Where did you get your dolsot? Which store? What size of your dolsot? 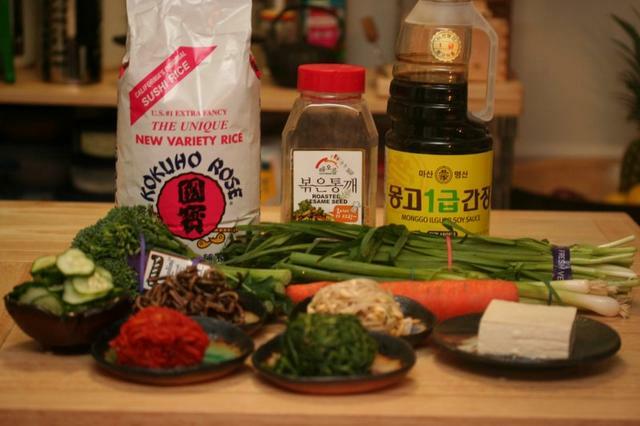 My friends gave me a dolsot and I’m looking forward to making delicious cripsy rice and bibimbop! I don’t have one of those plates with the handles though, will have to look around 99 Ranch Market. oh man, this looks uh-mazing. 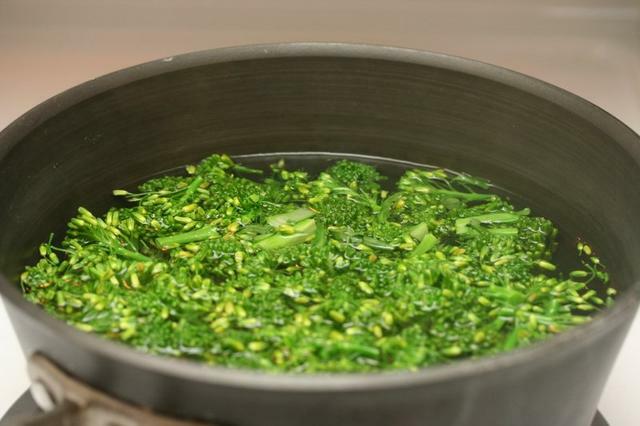 are you seasing the pots with toasted or untoasted seame oil? 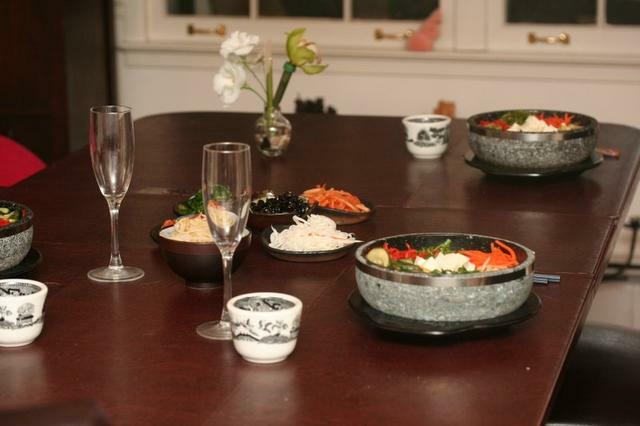 i used to teach montessori school in annandale and there was this amazing un-namedkorean restaurant right on the main drag. they did great vegan banchan and had the most delicious tofu dish. it was a block of fresh raw tofu set upon a plate of fresh watercress that was seasoned in some kind of gojuchang sauce. everything else on the menu was heavily un-vegan. and with the toasted barley tea–!!! head explode-y. 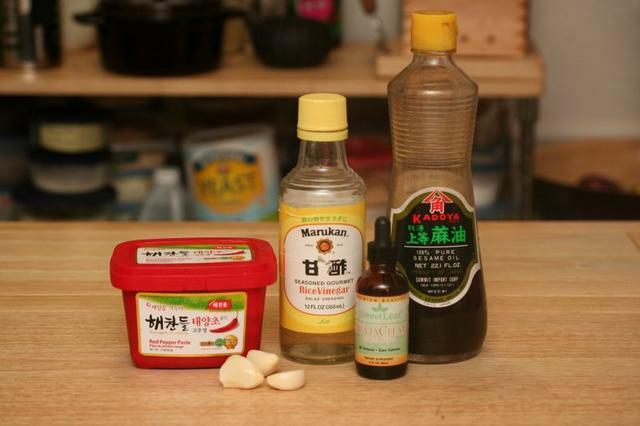 Kittee, I’ve used both toasted and untoasted sesame oil depending on what I have on hand. I don’t know that I really have a preference, although I don’t think the flavor of the toasted oil really comes through much, so probably just untoasted if I have both. You know, we’ve lived close to Annandale (we’re in Fairfax) for several years now and have yet to visit any of the Korean restaurants there. I have no idea why not, and I do often say we need to; it’s just never happened. I’ll have to look for that place because we love fresh tofu…and I could make a meal of banchan if they’d let me. I would like to buy some dolsots as a gift. I went to koamart.com but have a couple questions. They sell the stone bowls with or without a lid. The dolsots with the lid have a metal band and the ones without the lid don’t have a metal band. 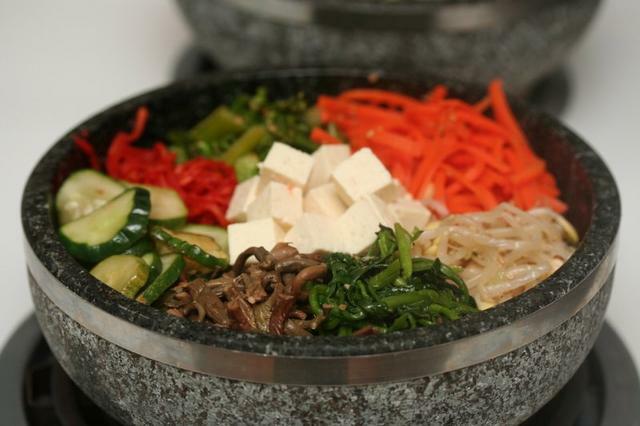 Do I need a lid for bibimbap? What is the purpose of the metal ring/band? Is it better to have a pot with one or without? Hi Heather, you don’t need a lid; I don’t have one and haven’t felt as if I needed one. I honestly don’t know what the purpose of the metal band is. My dolsots have it, but the ones you see in restaurants generally don’t. I think it’s just decorative. Many thanks for the detailed instructions and the pictures. There is a restaurant I go too ONLY because they make excellent bibimbap….I am a sort of bib crazy. I will certaily try it myself now, thanks to your help. Love your blog and recipes. I’ve been wanting to make bibimbap at home forever and was concerned with not having the correct stove top. Thanks for demystifying it for me. Korean food rocks! I want to add my thanks for your wonderful directions and pictures. 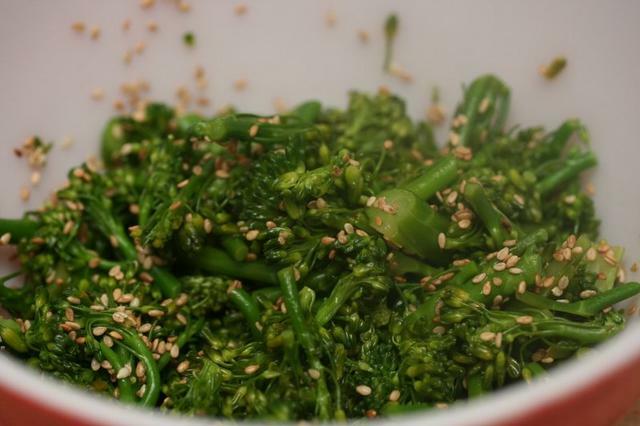 We have a nice local Korean restaurant that serves dolsot bibimbap–and I became addicted! So for Xmas I’ve received enough dolsots for the family, and by using your recipe, we have all enjoyed several fantastic dinners. Learning to use the dolsots has really been a process for me. At first I would only heat them in the oven. However, your pics of setting them on the stove encouraged me, and I’ve found that the work best that way. They make an amazing crunchy rice coating on the bottom of the dish, and the food tastes best. 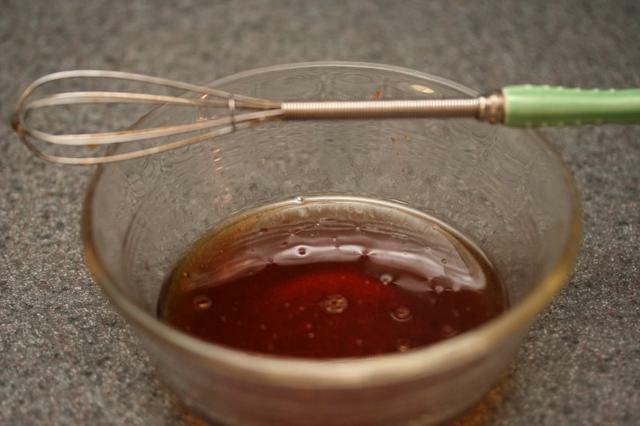 For those in the family who are not spicy food fans, we’ve used teriyaki sauce. 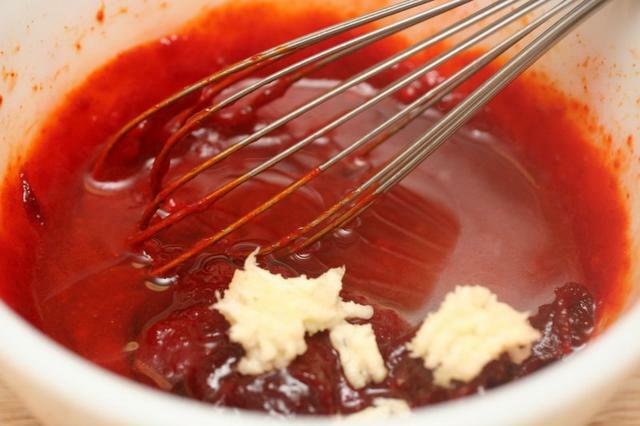 I personally can’t get enough gochujang, but younger folks seem to need a more gradual introduction. Again, thanks so much. Your directions are the ones I go to over and over. Hi – Thanks for the tutorial!! I have been planning to buy dolsot bibimbap bowls. I can only find granite ones that come with wood trays. Where did you get the plastic trays? 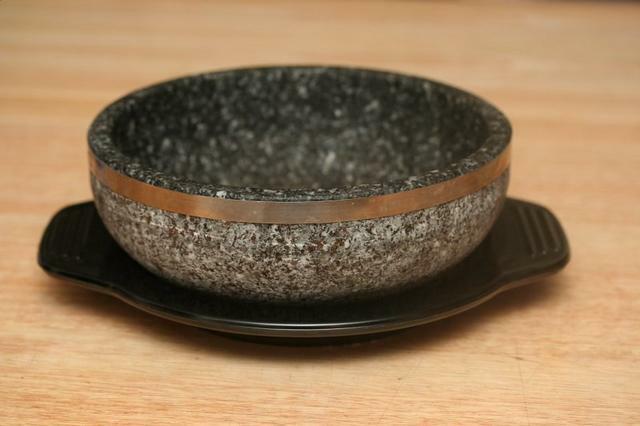 Or do you know a place where the granite bowls can be purchased with plastic trays?